18/65 Private Wallace Featherstone, 18th Battalion, Durham Light Infantry was killed in action 1 March 1917 and is buried at Gommecourt British Cemetery No. 2, Hebuterne, France. He was about 34 years old and commemorated on the Etherley War Memorial, the Roll of Honour in St. Cuthbert’s Church, Etherley and the Evenwood W.M.C. Memorial Plaque. Wallace’s older brother 14017 Private Jonathan Ralph Featherstone, 10th Battalion, the Durham Light Infantry died of pneumonia 28 February 1917 and is buried in Etaples Military Cemetery, France. In 1901, the family lived at Lands Bank. 41 year old Wallace and 20 year old Jonathan worked as coal miners. By 1911, the family lived at Rowntree, Morley. Wallace and Margaret had been married for 30 years and he worked as a farmer/coal miner (a hewer). His sons, Wallace, Jonah, Herbert and Grieveson were all coal miners (hewers). Florence aged 18 had no occupation recorded so probably helped her mother at home. Bryan aged 12 and Albert aged 11 would still be at school. The oldest brother Jonathan is not mentioned in the 1911 family details so is assumed to live elsewhere. Wallace’s father died 19 May 1916, his sister Florence 29 May 1916 and his brother Albert died 21 June 1918. Wallace’s mother, Margaret died 23 May 1920. At this time the family lived at Cox House Farm, Windmill near Morley. 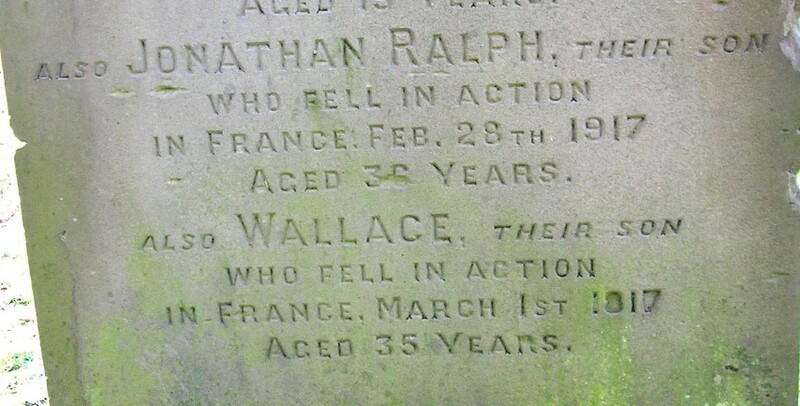 Wallace’s older brother, Jonathan enlisted as Ralph Featherstone and died of pneumonia 28 February 1917, in a military hospital in Etaples, France. Wallace’s younger brother Grieveson served with the ASC Remounts before joining the 5th Buffs. He survived the war. The battalion was stationed at Hartlepool from 16 October 1914 and was the first DLI battalion to come under fire when Hartlepool was bombarded by a German squadron of warships, Derfflinger, Von Der Tann and Blucher. The battalion lost 5 men killed and 11 wounded. The battalion was the only DLI battalion to see service in the Middle East. 6 December 1914: embarked upon SS Empress of Britain heading for Port Said, Egypt via Gibraltar, Malta and Alexandria arriving 21 December. 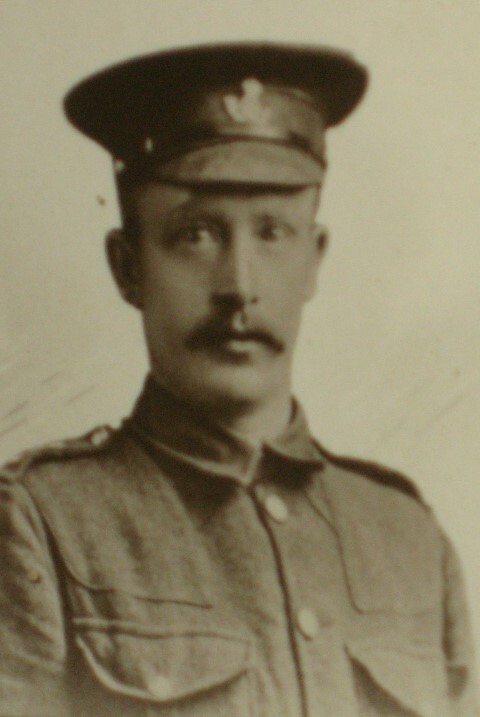 18/65 Private Wallace Featherstone entered Egypt 22 December 1915. 5 March 1915: 18/DLI embarked upon SS Ivernia headed for Marseilles, France. 30 March 1916: 18/DLI was in the trenches north-west of Beaumont Hamel in the region of the Somme, north-west France. The 31st Division took part in the Battle of Albert in the assault on Serre which was the first phase of the Battle of the Somme. The Division suffered very high casualties and accordingly was withdrawn for several months to return for the tenth phase, the Battle of the Ancre in mid November. 1 July: 18/DLI “D” Company formed part of the assault troops. The other 3 battalions were in reserve, in Maitland Trench. At 9.30 the 3 companies of the 18th were ordered forward to Monk Trench – into German shell fire then they were distributed into Flag, Maitland and Monk Trenches. Wounded and the dead were removed under shell fire. The front line no longer existed as a fighting trench, communication trenches were nearly obliterated. All afternoon and evening, the work of reorganisation continued under constant Germen shell fire. It was known that some infantrymen had entered Serre but all thoughts of a fresh advance were abandoned. The 18th took over the front line on alert for any counter attack. Firing died down during the evening and the night was quiet. 2 July: the Battalion was ordered to hold the front line with one company during the day and double the strength at night. The remainder of the battalion occupied South Monk Trench. British gunners fired upon the enemy to mask an advance further south and this brought about retaliation on “C” Company who lost 2 officers and 10 men. At 8pm North Monk Trench was “drenched” with tear shells. “C” Company set out to rescue the wounded. 40 were brought in. The dead were buried. 3 July: In the early hours, a bombardment of high explosive and tear shells rained on the British trenches. 5 July: 5am behind the lines at Louvencourt. The battalion then went to La Fosse for training then back in the line. 27 July: Neuve Chapelle: fierce German bombardment and the enemy entered D Company’s lines but were repelled. Losses of the 18th amounted to 79 from shell fire. 4 August: withdrew to La Fosse. The next “tour” was near Festhubert but this was generally a quiet sector then to Neuve Chapelle. 21 August: Givenchy: many men worked with the tunnellers. 9 October: Orville for training. 21 October: Sailly-au-Bois: took over support positions carrying out wiring and digging under heavy fire, then to Hebuterne and under heavy bombardment. End of October – Rossignol Farm – billets, working parties and training for raids. At this time no place on the front was worse than the Hebuterne sector – all roads through the village and the trenches were kept under almost ceaseless fire. 16 December: carried out a raid and returned with a few men slightly wounded. 18 December: Famechon: rest over Christmas. 26 February: 18/DLI took over from the 7/Loyal North Lancs.of the 19th Division. The German artillery pounded the British lines and No Man’ Land. A reconnoitre by 2 platoons took place and it was discovered that the enemy lines were deserted. 27 February: The area was occupied then handed over to the 4/Leicesters. By 7.30 the whole Moltke Graben was occupied from Crucifix Corner to Gommecourt Cemetery. 4 March: The action continued into the morning 4 March. The battalion was relieved by the 12/York & Lancaster Regiment then made their way to Rossignol Farm for a well earned rest. It is believed that Private Wallace Featherstone died 1 March 1917. It seems reasonable to assume that Private Wallace Featherstone lost his life during the action of 1 to 3 March 1917. 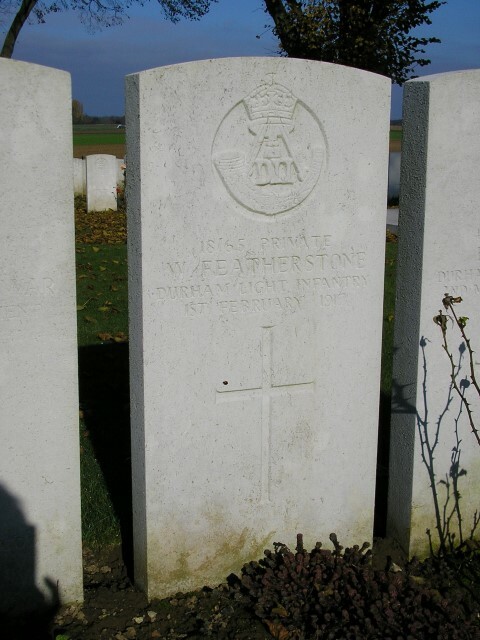 Private W. Featherstone is buried at grave reference III.L.9 Gommecourt British Cemetery No. 2, Hebuterne, France. The cemetery was originally laid out in 1917 but after the Armistice burials from the battlefield and smaller cemeteries were concentrated here. The cemetery contains 1,357 First World War burials and commemorations of which 675 are identified casualties and 682 are unidentified. Private W. Featherstone and his brother Private J.R. Featherstone are both commemorated on the family headstone in Etherley cemetery.